The $50,000 third leg of the Turf Endurance Series shaped up to be a battle of the first leg winners with Artistico holding off Royal Intrigue by a neck on Sunday afternoon as the series distance expanded to about 1-5/8 miles. 4U Thoroughbred Racing Stable’s Artistico set out for the lead from the inside post position and led the entire race for jockey Jesse Campbell. Meanwhile, Royal Intrigue settled towards the back half from the outside post and swept four-wide into contention approaching the six furlongs mark as the field began to bunch up. He continued in hot pursuit of Artistico down the stretch, but couldn’t catch the front-runner, who went the distance in 2:50.09. Camp Creek tracked the winner throughout and followed two lengths behind in third-place. Artistico had opened the series winning at 1-3/8 miles on July 1 but opted to race elsewhere skipping the 1-1/2-mile second leg on August 5, which was won by series newcomer Royal Intrigue. Trained by Sylvain Pion, the five-year-old Niigon gelding’s second endurance score gives him sole ownership of the top spot in the series standings, leading with 20 points. Royal Intrigue, who earned seven points bringing his total to 17, remains in striking distance for the finale. Points are awarded on a 10-7-5-3-2 basis for the top five finishers in each race. Horses finishing lower than fifth earn one point. Tesseron, the defending series champion, was pulled up around the far turn and humanely euthanized. The fourth and final 2-1/4-mile leg will be held on October 14 when the series winner will be crowned. The overall point-leader will earn a bonus of $25,000 for his owner and $15,000 for his trainer. Sent off at odds of 5-1, Artistico paid $12, $5.80 and $3.70. He combined with Royal Intrigue ($4.50, $3.70) for a $2 exacta worth $54. Camp Creek ($5.50) completed the trifecta, which paid $200.75 for a $1 ticket. Sine Metu edged out Lookin At Bravo and Itstartswithadrink for fourth-place, rounding out the superfecta, which was worth $725.90 for a $1 ticket. 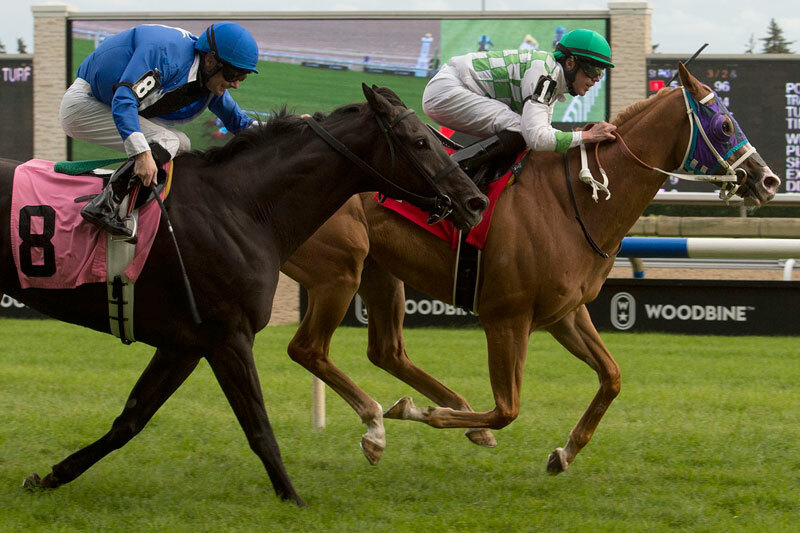 Live Thoroughbred racing continues at Woodbine on Wednesday evening. First race post time is 6:45 p.m. for the eight-race card, which features a Jackpot Hi-5 carryover of $631,143.79.